EcoPayz is yet another company that offers its clients an e-wallet. It's very useful to say the least if you want to play poker. Read the text below to get to know the details of what they can do for you. 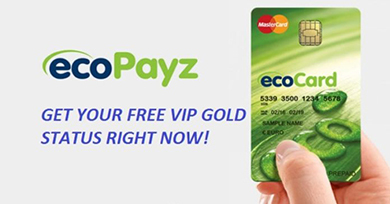 Thanks to our cooperation with ecoPayz you can quickly get the VIP Gold status there for life. Normally you would need to deposit €25,000 but with us - you get it for free. Not a single deposit needed. If you are interested we would recommend opening Ecopayz account straight away and verifying it - you don't need to use it or make deposit right now, but as the promotion is limited in time and lasts for life, better take advantage of it! EcoPayz is in many aspects similar to Skrill and Neteller. It's a world renowned platform that offers financial services to individual and business clients. They have been on the market for several years, but now they became more known worldwide.PSI-Pay, that owns ecoPayz regularly goes through checks done by Financial Conduct Authority. It means the company works legally in the European Union and your money is safe. If you would like to open an ecoPayz account you can do it quickly and without a problem. It takes a few minutes only and you need to give the standard information: name of the user, email address, some personal data and phone number. After accepting the terms and regulations all you have to do is click “create an account” buttton. Thanks to LiquidPoker you can be gold VIP today! We have prepared a great offer for our readers who would like to try ecoPayz. Just click one of our links and provide the documents needed (instruction above) to enjoy Gold status! There are no other requirements. All you need is our link and positive verification. What does Gold status give you? Better status means more comfortable access to your funds. For instance you have higher transfer limit to poker rooms. Above that you have no general transfer limit. Users with gold can also create sub accounts, which works great if you play on different rooms with different currencies being used. You get withdrawals and transfers for free and the currency converting fee is just 1,49%! If you want to use a card the system will automaticall deduct €1 or 2 from the balance. The card will be verified immediatelly. You can also do it manually by clicking “Verify” -> “Bank cards and accounts”, and then choosing the currency and amount. Second option is a local deposit. You can choose from PayU, Trustly, Paysafecard and other methods. Minimum amount is €10 or equal value in another currency. Remember though that this means fees (from 2% to 7%). Keep in mind that the scan or photo of ID should be high quality, clearly visible and with all information valid. EcoPayz does not accept print screens as means of verification! Photos can be send directly from the account. The verification process takes 1-2 days. Additionally ecoPayz offers to all Silver and better users a chance to apply for a Mastercard credit card. The limit is three cards available in the following currencies: euro, pounds and US dollars. These are the fees for using ecoCard. ATM withdrawal costs you 2% (minimum $/€1.50) and 2.99% for currency exchange. Limits for ecoCard depend on your VIP ecoPayz level.